Cross Vermont Trail Association - Blowout! 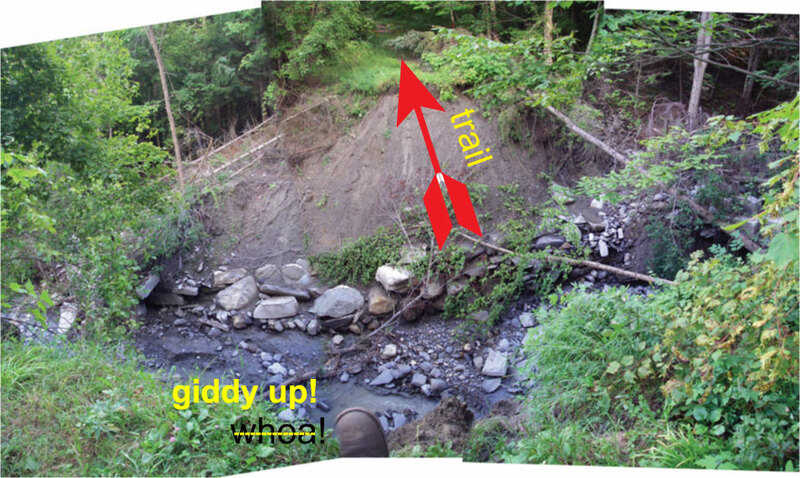 Significant washout of trail in East Montpelier needs your help. The blowout makes a dramatic cut across the railroad bed. (Photo taken 8/30/2011.) You can see remains of the old stone block railroad culvert running parallel to the brook, at base of the opposite bank. Truthfully, the stream is probably happier to be free of that constriction. Any new crossing will also provide significantly more room for the river to pass through. We are fixing the big washout. 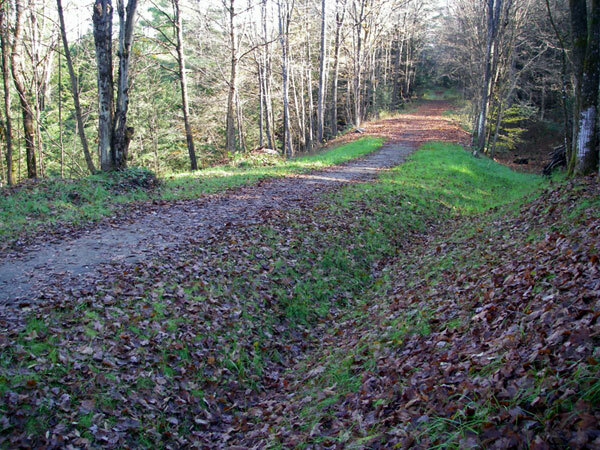 CVTA has purchased a permanent easement from Fairmont Farm for the trail across the property with the washout. We can now either rebuild the railbed or build a sustainable long term bypass trail, and stabilize the washout so it doesn't continue to erode. Probably we will stabilize, maintain the small trail that goes around by the brook, and also build a larger relocation that can be shared in the winter with snowmobile trail. But - we're working on the details and you can have a say if you'd like, just give a call. CVTA is resolved to find a solution that allows safe, sustainable use by through traffic. Give us a call to learn more. 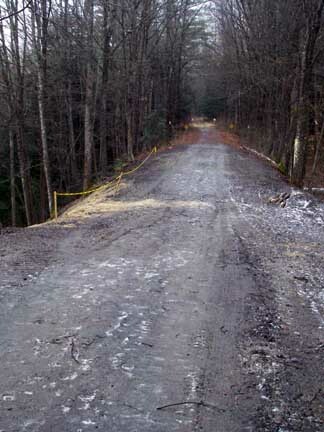 CVTA is now helping to maintain the smaller trail that has been created by users to make a "go-around" the washout. Thanks to all the spontaneous help from people who have been helping to keep this trail open! For the coming winter 2017-18 the snowmobile trail will still use the alternate route to get around the washout that's been in place since 2011. This relocation was put together by the landowner (Fairmont Farms), and the East Montpelier Gully Jumpers and Barre Sno-Bees snowmobile clubs. It is not open for summer use. If you are interested in using the snowmobile trail system during the winter, you can purchase a Trail Maintenance Assessment (aka a trail pass) from a number of local businesses. 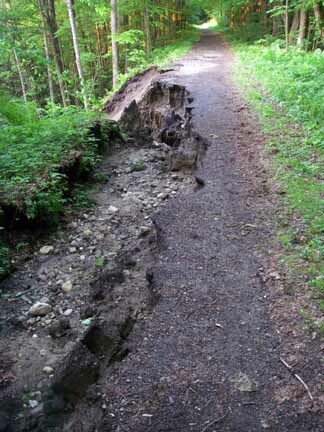 Help for the final repair of the big blow out is needed from all trail users. Help is especially needed from people who use the trail in the summer, and who use the trail in a non-motorized way, to cover the additional effort of repairing this section of trail in a way that will work for four season, multiple use. The slump has been filled in as of October 2011. Site clean up and revegetation was completed in 2012.
and about 0.9 miles east of Rte 14 trailhead. Fall 2012 at "the slump." Ditch is re-established. Grass is growing. over the bank at the top of the photo. We look forward to helping finish the remaining work.